First, the good news: there is an Aipa sting for sale on eBay, whose pictures I have included here. The board is in decent shape, and right now the current bid is a tidy $82.01. Before I go get to the bad news, I’d like to give some background on Ben Aipa, who has made more than a few appearances on Shred Sledz. This is the first Shred Sledz post featuring a board that Aipa made under his own name. The sting is Aipa’s claim to fame. The board pictured above is a classic example. You’ll see the wings extremely high up the board – well above the fin box – with a single fin setup in the back. Aipa’s stings frequently boast swallowtails, as well. Aipa’s sting design (sometimes referred to as the stinger) is most associated with iconic Hawaiian surfers Buttons Kaluhiokalani and Larry Bertlemann. Here’s a picture of Aipa (on the left) with Buttons, in front of a spread of Aipa-shaped stings that would be worth a pretty penny today. And as a bonus, here’s another Aipa board, this time under the careful stewardship of legendary Aussie surfer / shaper Mark Richards, likely also taken sometime in the 1970s. Look at how far back MR has the fin! So, back to what we were saying: there’s an Aipa for sale on eBay, it’s only $80 bucks or so, and it’s Aipa’s signature design. What’s not to like, right? The sad fact is, the “Surfing’s New Image” boards were NOT shaped by Aipa. Rather, Aipa licensed his name to the “Surfing’s New Image” brand, and these boards were all shaped in California (not Hawaii, where Aipa is based) by a variety of different shapers, including Mike Slingerland, Rick Hamon, and apparently even Donald Takayama. This information was confirmed to me via an email with none other than Randy Rarick, the Don Dada of Hawaiian surfboard design. I happened to make this rookie mistake, and I now am the proud owner of two VERY weathered SNI / Aipa stings that serve as a cautionary tale. (The caution is two-fold: make sure what you’re buying is legit, and NEVER tell your fiancee how much you spent on the boards.) See below for two examples: the first is unsigned (likely shaped by Slingerland, but who knows), and the second has a clear Hamon signature and serial number. You’ll see a lot of stings online with the SNI branding. I won’t tell you to steer clear of these boards completely, as they are still genuine, rad 70s shapes. But don’t make the mistake of thinking that these are on par with real handmade Aipa boards. Aipa has signed many of his boards, and you can see below for an example of a clearly identifiable Aipa signature, taken from a late 90s thruster he shaped. I won’t get too into the weeds of signatures. Just note that “Surfing’s New Image” boards, even if they bear Aipa’s name and his best-known silhouette, were not shaped by Aipa himself. Here is a link to the board you can find on eBay, and if you happen to find a genuine 70s sting for cheap, feel free to send it my way! A million dollars isn’t cool. You know what’s cool? Photo from The Inertia; copyright Art Brewer. Mr. Bertlemann, the Hawaiian pro surfer dubbed “Rubberman” for the physics-defying body torqued that defined his surfing, was one of the best known surfers of the 70s. 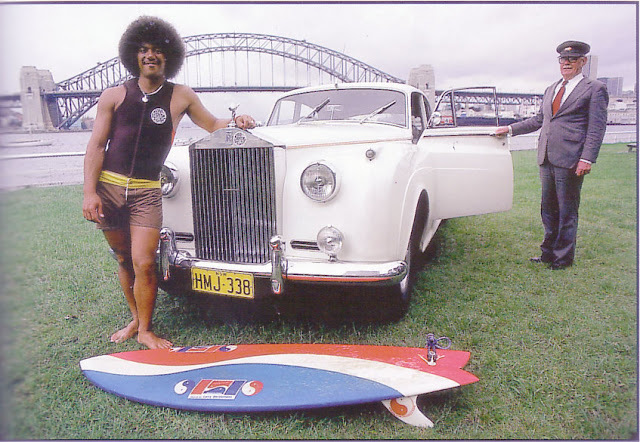 Bertlemann was one of the few men who could truly lay claim to having a signature style, whether it was his radical surfing, his awesome hair, or, of course, his surfboards. Bertlemann was sponsored by Pepsi during the height of his career. He embraced his role as an ambassador (some might say billboard), going as far as to decorate his boards with the Pepsi logo. The Pepsi boards have not only become synonymous with Bertelmann’s legacy, they are one of the more enduring symbols of 70s Hawaiian surf culture itself. One of Bertelmann’s infamous Pepsi boards is currently up for grabs on eBay. It is a classic twin-fin swallowtail shape (not sure if it qualifies as a fish or not…anyone got thoughts here?). Even better, it bears a Donald Takayama signature, and one of Takayama’s clear bird logos (I believe it’s an ewa / frigate bird, but also cannot confirm). There’s a bit of damage around one of the glassed on fins, but hey — that’s a small price to pay for an iconic piece of Hawaiian surfing history. Author Henry KnappPosted on August 8, 2016 August 8, 2017 Format GalleryCategories UncategorizedTags Donald Takayama, larry bertlemann, vintage surfboardLeave a comment on Takayama, Bertlemann…and Pepsi?